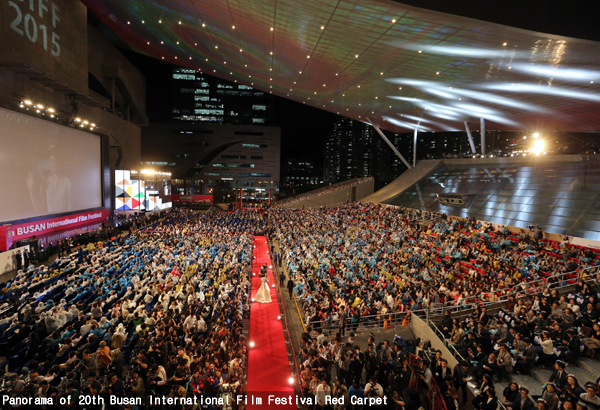 On Thursday evening, in spite of typhoon warnings in Southern Korea, the Busan International Film Festival (BIFF) rolled out the red carpet to welcome countless stars to the opening ceremony of the 20th edition of BIFF at the Busan Cinema Center in Centum City. Hosted by Korean star SONG Kang-ho and Afghani actress Marina GOLBAHARI, the ceremony kick-started this year’s BIFF in style, which will present some 304 films from 75 countries, among them 94 world and 27 international premieres. Among the many stars who braved the poor weather in Busan, which led to the closure of the local airport, were Office lead KO Asung, Veteran star HWANG Jung-min, Chinese actress TANG Wei, top actress JEON Do-yeon and star SON Ye-jin, supporting her new film Bad Guys Always Die. The ceremony featured a special performance by Korean soprano JO Su-mi with the Busan National Traditional Music Center orchestra. Next, SUZUKI Toshio, TAKEDA Mikiko, AOKI Takayuki and TAI Yukari attended the ceremony representing the famed Japanese animation outfit Studio Ghibli, which was awarded the Asian Film Maker of the Year Award. The 20th edition of BIFF will run until October 10th.